Pictured above is the cast of a play written by Yakov Gordin, performed, directed and acted in a Kurenets playhouse by citizens of Kurenets. Standing first from the right to left is Zalman, son of Moshe. 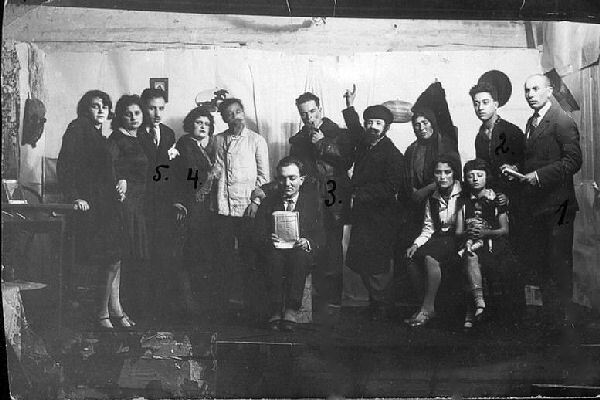 Binia Alperovich is to his left; Eliyahu Chaim, son of Nechama Risha (nee Gelman), and Mendel Zalman's Alperovich; fifth from the right is David son of Leib Motosov. Standing seventh from the right is Rivka daughter of Rachel and Aharon Shulman. Eighth from the right is Shmuel Spector.